Digitalization has transformed the epoch on the mouse click or touch of a mobile phone to every possible extent. Resultant, the approaches become easier and tasks have computed as simpler. From shopping to dating, business to research, holding business meetings to keeping social contacts all are in the same phase and the whole world is getting submerged into one term i.e. on the Internet. Significantly, learning is not only restricted to the classroom but also available on the digital platform is known as Electronic Learning or E-Learning. E-Learning, the word specifies the concept that the learning through the electronic device like desktop, laptop, CD-Rom, Digital Television or mobile. However, now the learning through mobile also referred as m-learning. Students have a different opinion with regard to eLearning and some are very enthusiastic and excited while some have hesitation for this innovative approach. So, let’s clear doubts by focusing on the following challenges and advantages. Generally, there are three types of e-learning process – Synchronous E-Learning, Asynchronous E-Learning and Blended Method. In Synchronous E-learning, the learning is carried out in real time process through a virtual classroom. The student and the instructor have to interact at the same time through the usage of the internet and communicate via messaging, chatting, video conferencing or calling. Asynchronous E-Learning is the learning through the recorded medium. It is not based on the real-time learning process. Its carried through lectures, online study material, embedded learning, courses or the discussion groups. Blending method inculcates the features of both the Synchronous and Asynchronous learning. Flexibility: In the traditional classroom, students have to go to college or institute regularly with the scheduled syllabus that needs to be accomplished at the specific time period. While e-learning method offers you the flexibility to study anytime, anywhere with your own timelines. Fast-pace Learning: Students can study at their own speed and interest. They do not need to try to match up with other student’s speed and pace. They can wrap up their syllabus as fast or as slow as they want. All-time Access: The syllabus and study material are available online that offers access anytime and anywhere, so the students do not have to worry about when to sit down for study, they can do it anytime and anywhere. Higher Retention and understanding: In online classes, the learning process is carried out through presentations, images and videos. It is a well-known fact that visual contents register easily in human memory than verbal and text contents. It helps to understood things better and increases the retention and understanding ability of the student. Immediate feedback and results: In traditional learning, it takes time to check copies and declare results. While in e-learning, tests are taken through online quizzes. This has reduced the time to generate results and has also gained greater appeal amongst students as they do not have to face the teacher at the time of the result. Greener Approach: Papers are crafted by cutting down trees. 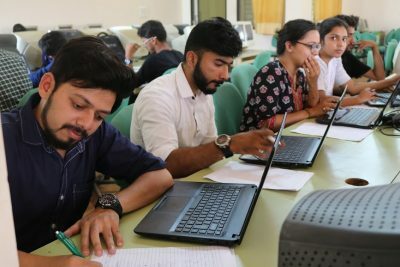 In e-learning, students are saving papers – saving trees. So, this is an environment-friendly method of learning. Cost Effective: Undoubtedly, the usage of internet reduces the cost of paper, books, notebook, files, pen and other stationery products. In addition, it also reduces the cost of traveling to the college or learning center. Hence, e-learning is a cost-effective learning method. Easy Updating: It is very easy to update notes and other lectures in the online mode by the instructors, and its really difficult to make changes in the published books at a short notice. Techno and Internet savvy: with regular accessing the internet, students become acquainted with the devices. This brings proficiency in the usage of internet and information technology. Self Discipline: In regular teaching methodology, teachers or instructors have greater control over students attentiveness and behavior. They motivate students to learn through interactive teaching styles. However, in e-learning student should have to exercise self-control to study and to learn. Computer literacy: Student should have computer literacy and basic troubleshooting skills to continue study without any breaks. Availability of system and internet: Student should preferably have their own system/ laptop and high-speed internet connection for e-learning. Learning Approach: In regular learning, the student interacts with the instructor and other students that make study interesting. In e-learning, the student may feel bored studying alone. There will be no discussion and no second opinion that may lead to one-way thinking. Despite all these challenges, E-Learning is still the modern and future way of learning in this ever-growing busy society. Students of IPER MBA are also regularly adding to their profile with new skills through online certifications on MOOCs, which is highly appreciated by the College.